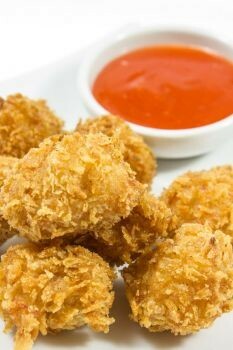 ​These chicken nuggets are baked instead of fried for a healthy alternative to one of kids favorite meals! Preheat oven to 400 degrees. Oil a baking sheet with olive oil. In a bowl, whisk together milk, egg and seasonings. Place chicken into the egg mixture and then Panko breadcrumbs. Place chicken on oiled baking sheet, sprinkle with salt and bake 15-20 minutes, until breadcrumbs are lightly browned.